As more IT investment goes to DevOps or app development, infrastructure often does not get the budget assistance required, and as a result, complexity actually increases— the exact opposite of what the business expects and needs. While simply leveraging technologies like all-flash offer immediate performance benefits, when implemented alone they can be short-lived and quickly become burdens as demands change. 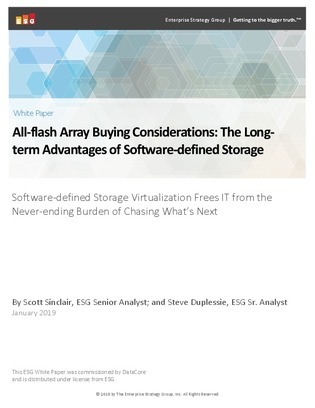 In this situation, ESG analysts recommend separating your infrastructure elements by virtualizing them with software-defined storage (SDS). Continue reading for an examination of SDS’s long-term advantages, 10 benefits of SDS (as told by your colleagues), and how SDS can actually increase the value of existing infrastructure investments.